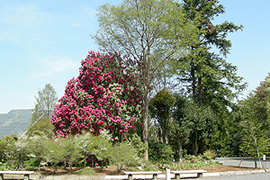 The Promenade that welcomes visitors to the Garden is lined with giant trees. 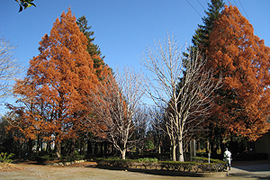 The world's tallest trees, sequoia trees and metasequoia trees known as living fossils are alternately lined both sides of the Promenade. 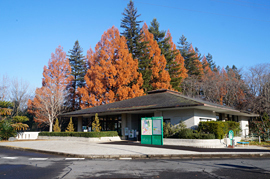 Also Aesculus trees such as buckeyes, horse chestnut trees are displayed in the center. 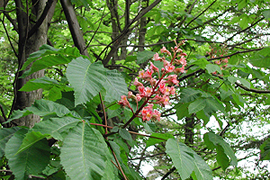 A hybrid between the American Aesculus pavia and the European Aesculus hippocastanum, grafted onto an Asian variety of Aesculus as the rootstock. 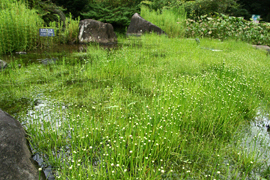 In the Central Circle that opens out from the Promenade, can be seen Rhododendoron ‘Taiyo’ with their bright red flowers, threatened aquatic plants, carnivorous plants, Mendel’s grape, and other plants from Japan and overseas. This building at the entrance to the garden is an education center for displaying plant diversity, significant role of plants in ecosystem through panels. 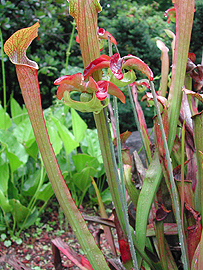 The Building also holds exhibitions that highlight seasonal plants, and provides information on using photographs. The library has photo albums and picture books of plants. Volunteers conduct guided tours of the garden during the weekends. This building is located on the east side opposite Tropical Rainforest House. Aquatic Plants House is also located in the same building. An exhibition titled "Interacting Biodiversity" is held on the stairs that go up from the first to the third floor. The second floor has laboratories for tissue culture and study. Seminar rooms are available on the third floor for holding various events and lectures. 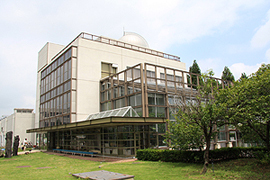 The building also boasts rooftop stargazing facilities and stargazing events ‘Nights for Astronomical Observation’ are held once every month to view the surface of the moon or other stars that may be visible at the time, using large telescopes. Visitors can eat and rest in the corridors on the second and third floors.